BT Sport is to broadcast the next instalment in its BT Sport Films series, One Day in May: The Story of The Bradford City Fire, on May 11 at 9.30pm on BT Sport 1. New version includes Chromecast compatibility among improved features BT has unveiled a new version of BT Cloud, its secure storage, back up, access and sharing service for BT Broadband and Infinity customers. Worth a lulla-try: Ice Ice Baby vs Moon River… What’s your ultimate baby snoozer? When it comes to getting babies to sleep, classic lullabies are often put to one side as parents find inspiration elsewhere. Much like Ross and Rachel in Friends, research by BT found that over a third (37 per cent) of parents chose hip hop songs to sing at bedtime. Viewers of BT Sport will see the spotlight focus on the Barclays Premier League relegation issues with exclusively live games in May kicking off with Leicester City v Newcastle United. England and British and Irish Lions star Ugo Monye has been unveiled as BT Sport’s latest signing following the announcement of his retirement from Rugby Union today. BBC Two has acquired the rights from BT Sport to show the new series of The Clare Balding Show in an innovative new deal, which will see the show screened on both channels. The new 12-show series starts on April 2. The weekly hour-long entertainment and sport chat show will air on BT Sport on Thursdays with a half-hour show airing on BBC Two the following evening. Aviva Premiership Rugby will be broadcast on BT Sport for the next six seasons in a ground-breaking new TV deal, Premiership Rugby can confirm. The top flight of English club rugby will be live on BT Sport until at least the end of the 2020-21 campaign. BT Sport’s The Supporters Club is launching a partnership with the Homeless FA focusing on their Team England and Training Centre programme. Harry Potter and James Bond are the nation's most loved book to film adaptations To celebrate World Book Day, BT TV has polled the Nation to find the 100 most popular book to film adaptations, and Brits are leading the way with Harry Potter and James Bond taking the highest spots on the chart. With more than 90 million wi-fi devices sold in the UK last year, the rapid demand for wi-fi access continues to grow and tablets and wi-fi devices are becoming more commonplace in UK homes. Customers want to get online all around the home, including bedrooms and even in the bathroom. BT Sport today announces that it has extended its deal with MP and Silva for exclusively live Italian top flight football until 2017/18. The channels are the current home of exclusively live Serie A in the UK and BT Sport has signed a contract to add another three years to the current deal. BT Sport will have the rights to show up to 380 exclusively live matches a season. The latest exclusively live Barclays Premier League games to be shown on BT Sport throughout April will follow the race for UEFA Champions League places and kicks off with Arsenal v Liverpool and ends with Southampton v Tottenham Hotspur. BT is to show even more live top-flight football matches on its BT Sport TV channels after winning exclusive live rights to 42 Premier League matches in each of the 2016/17 to 2018/19 seasons. This is an increase of four matches per season on the current 38. ​BT Sport and ESPN have signed a seven-year agreement to expand the range of ESPN content on BT Sport. The agreement also covers the use of the ESPN brand and potential joint digital media initiatives. 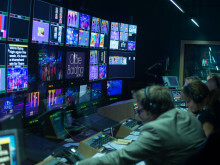 The new long-term collaboration builds on the successful relationship between both brands following the acquisition of ESPN’s UK and Ireland television business by BT plc in 2013. ​BT Sport will have a feast of football in March with five exclusively live Barclays Premier League fixtures, starting with Arsenal v Everton, and at least two 6th round FA Cup clashes as the knockout competition reaches its last eight teams. ​Consumers are set to benefit from cheaper broadband after BT today announced that it is to offer three new broadband package deals for new customers – BT’s most significant savings ever. The packages start from £4.75 a month for a 12-month contract for BT broadband – a saving of up to 63 per cent. ​Two London derbies are the centrepiece of exclusively live Barclays Premier League action on BT Sport in February and the start of March, including the big north London game pitching Tottenham Hotspur against rivals Arsenal at White Hart Lane.